Solid dry film coatings are a permanent lubricant designed to reduce friction, heat and wear on internal combustion engines. Unlike most polymer coatings, solid dry film will not break down from corrosive fuels, oils and their by-products. Click here to see pictures. Pistons - The most common causes of wear on the piston skirts are cold starts, hot restarts and oil breakdown. These conditions allow the piston skirt to contact the cylinder bore, resulting in scuffing and higher temperatures. 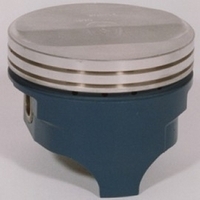 Coated pistons eliminate this problem by preventing contact of the piston skirt and bore. In addition to this, dry film has a very low coefficient of friction, requiring less energy to reciprocate the rotating assembly. With higher rpm this effect becomes even more pronounced. Connecting Rods and Crankshafts - Dry film is oleophobic (sheds oil), it prevents oil from clinging to these parts as they rotate, keeping them in balance and helping oil return to the sump faster. Bearings - Prasitic drag caused from oil trying to cling to both the crank and the bearings is greatly reduced when using coated bearing shells. Again, this is due to the oleophobic properties of the dry film coatings. Bearing failure due to high crank loads and oil shear are also greatly decreased. Valve Springs - Springs tend to have a lot of friction between each other, as well as the head and the seat causing failure; by dry film coating, the springs friction is nearly eliminated and heat is reduced, resulting in greatly extending spring life. Block Valley and Oil Returns - The main function in coating these areas is to allow the oil to return to the sump faster. All solid dry film coatings reduce friction, which in turn increases the performance like of the components it has been applied to. For more information on applications that most beneficial to your specific needs, please contact our Technical Department. Click here to see pictures.